Sunday brunch is my favorite part of the week because we normally have no where to be. Sunday is usually reserved for just the two of us – we talk about the week, catch up on tv, play a game and brunch! It is our little tradition that I love, and, while normally we just have eggs and toast, I try to make one special brunch recipe a month. 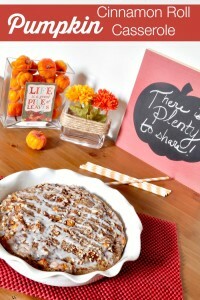 Last month I made the super yummy Pumpkin Cinnamon Roll Casserole. I mean, how can you go wrong with cinnamon rolls? Since we are all about apples this month at The Love Nerds, I decided to make an apple version, too. 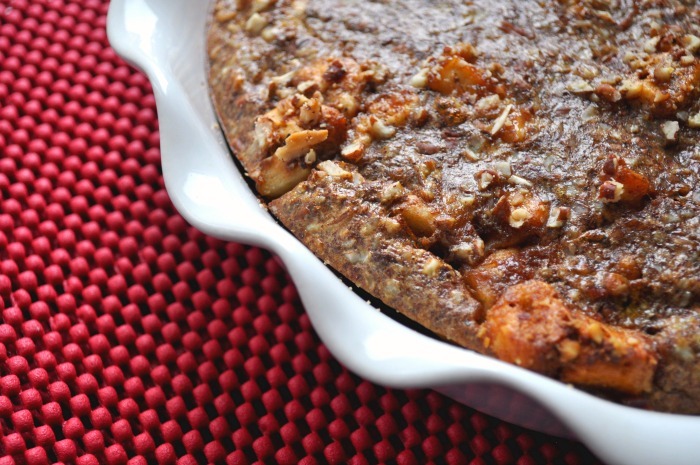 Say hello to the Apple Pie Cinnamon Roll Casserole. I could have just switched out the pumpkin butter for apple butter, but I wanted even more apple flavor. Apples have always been my favorite! So I decided up a small apple and tossed it in with the cinnamon roll pieces. 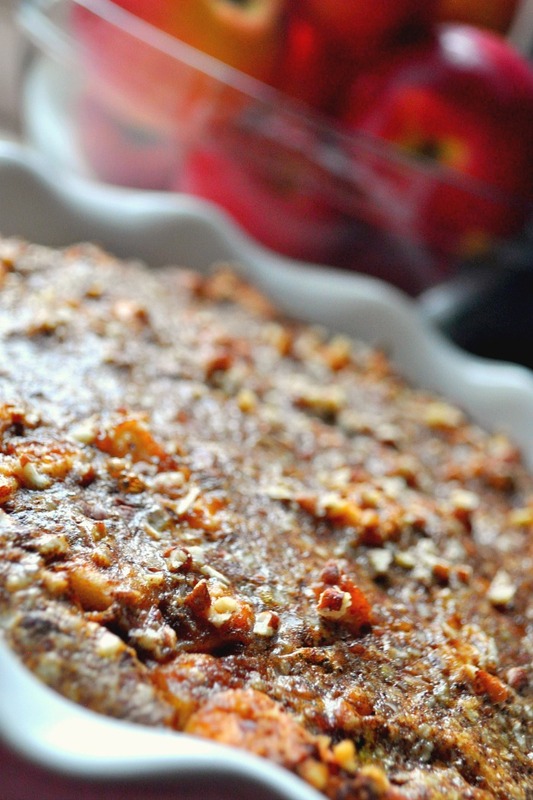 The apples baked for just the right amount – soft and juicy with just enough bite left. It was delicious! I also added cloves into the mix this time around because apples and cloves is a winning combination in my book. The perfect brunch recipe for a special occasion! 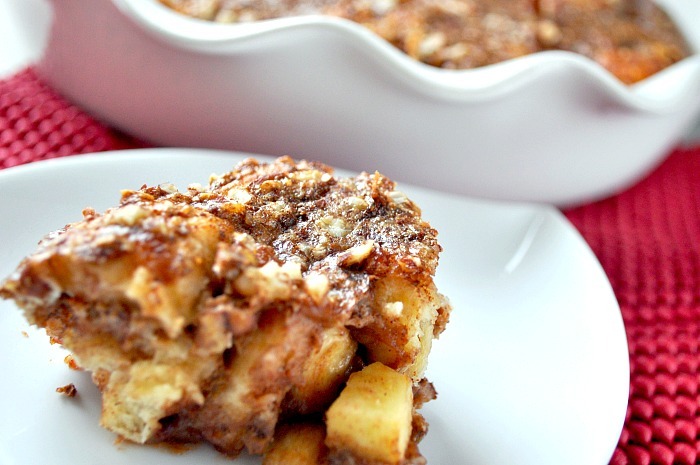 A delicious and fluffy Apple Pie Cinnamon Roll Casserole! You will love it! Spray your pan of choice with a non stick cooking spray. Toss the rolls and diced apples into the apple butter and then place into your dish. In a bowl, whisk together the eggs, cream, vanilla, and spices until well combined. Pour the mixture over the cinnamon rolls, evenly distributing the mixture. Add the pecans on the top of the casserole. Bake for 25 minutes. It will turn a gorgeous rich brown color and fluff up slightly from the eggs. If using the icing, warm it up slightly and drizzle onto the top. 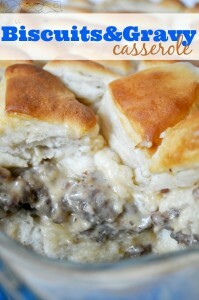 I truly hope you enjoy this brunch item!! You might even see another version of this cinnamon roll casserole for Christmas, or we might just make this Apple Pie Cinnamon Roll Casserole again for the holiday. 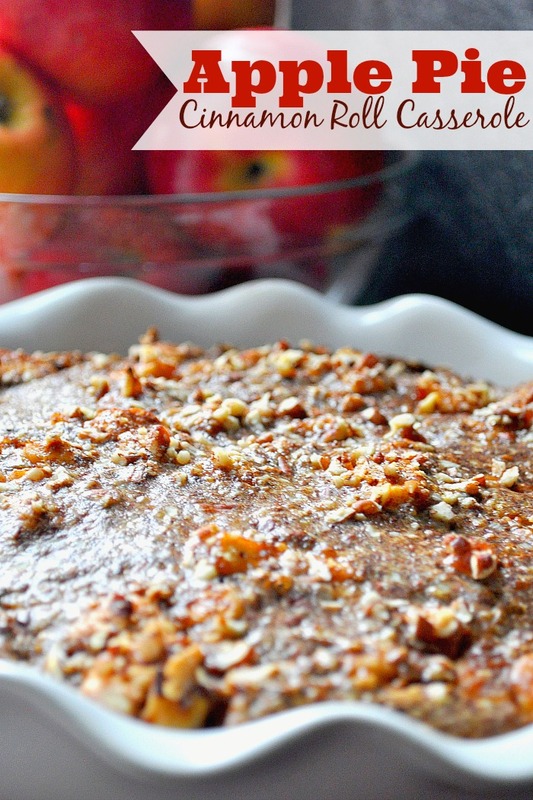 Seriously – the chunks of apple were just perfect! These look so amazingly delicious!!! Mmmm this looks incredible! Since it has apples in it that means that its healthier so I can have two servings right?